Application Express provides a good integration of the Oracle BI Publisher, not everyone wants to invest in this pretty expensive piece of software. A good open source alternative is JasperReports. I think most of the APEX developer out there use it. So do I! Hopefully you are familiar with the concept but here a short explanation. 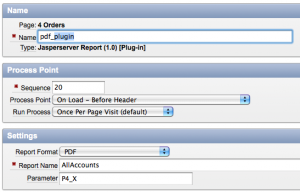 JasperReports is a open source Java Modul to generate different report outputs. For easier use there is a Server Application available called JasperServer. In fact this server is a Apache Tomcat bundled with JasperReports, an Administration for the report files and configuration and several other moduls. However, reports can be called through a URL. All information which is necessary to execute a report on the server will be passed through GET parameters, including the authentication data in plain text. You can now create a Button or Link in APEX and redirect to this URL to see a report, but obviously this is not the way how passwords should be transfered…. For that reason I wrote a package in PL/SQL, which makes it possible to tunnel all requests to hide login data and to close the jasperserver port to public. You can download my package including the APEX plugin here but first please read the tutorial. Everything is straight forward and most parameters are self explainable. Just look at the screens of the plugin settings and the process settings. That’s it a simple and clean solution to tunnel your reports.